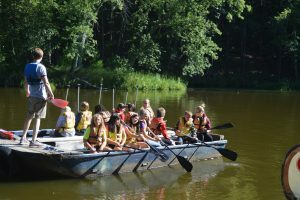 Summer is a great time for youth to attend a number of different summer camps offered through Upham Woods or in conjunction between Monroe/ LaCrosse County. Studies show that going to summer camp helps youth grow in areas of self- confidence, independence, making friends, exploring, and learning new activities. Providing students with this adventure has many great benefits that they will carry with them well into adulthood. Summer Camp is held in the summer for 4 days, 3 nights (tentatively) at Upham Woods 4-H Camp near Wisconsin Dells. Summer camp is designed for youth in 3rd – 6th grade. Please see the following summer camp info link to learn more about the summer camp opportunities available to 4-H youth. Outpost Experience is an option for older campers in grades 5-8. Camp Counseling- Going to camp would not be the same without youth camp counselors! This is a great leadership opportunity for members in grades 9-12. Clover Camp- Kindergarten through second grade youth come together from across the county to participate in science experiments, STEM, arts and crafts, and recreational activities. Tractor & Machinery Safety Course– The Tractor and Machinery Certification/ Training program has been available for many years to 14 and 15 year old youth wishing to operate tractors and farm machinery for non- related parties (for hire). This training program is designed to meet the necessary requirements for certification for compliance under Wisconsin Act 455 (youth under 16) and for those youth 14 and 15 desiring training and federal certification for farm employment (Part 570 Child Labor Regulations). The 24 hour training program (classroom and assignments) include: hands on instruction for tractors and farm machinery operation, hazard recognition and correction, general farm safety knowledge, and stresses the importance of a positive attitude towards safety. Boys and Girls Science Day Camps- A science day camp offered just for girls in 3rd– 6th grade and another science day camp offered just for boys in 3rd– 6th grade! Opportunities are provided to both the boys and girls to learn more about the science around them while gaining life skills and participating in exciting experiments. 3-6th grade Road Trip- Youth in grades 3-6 are provided with the opportunity to travel to certain parts of Wisconsin learning about our rich state history, heritage, and culture and some of Wisconsin’s industries. Clothing Preview – Members enrolled in the clothing project can enter this event. Judging is held in June and the style show is held at the Monroe County Fair in July. Members sew garments for this event and then model them. The top age-eligible exhibitors advance to the Wisconsin State Fair (county’s quota based on what is given from the Wisconsin State Fair Office). Foods Revue –Youth enrolled in the foods project can enter the Foods Revue. Participants prepare food items based upon project and grade level. Even is complete with table setting, menu and face-to-face judging; can choose to enter the poster or mini-booth categories. Participants who use three or more dairy products to prepare their food items may be selected for dairy promotion awards. Monroe County Fair– A highlight every year where 4-H members have the opportunity to exhibit and display their project work. The purpose of the fair, however, is for judges to provide valuable evaluations to exhibitors as to how their projects could be improved.